Yoga has four very important meditative postures: – Padmasana [Lotus Pose], Siddhasana [Adepts Pose], Swastikasana and Sukhasana [Easy Pose]. These postures are great tools for effective meditation. They help in calming the nervous system and in helping to attain physical, mental, emotional and spiritual stability. One should be able to sit in any of the four asanas for an extended period of time, without moving the body. Only then can you take on the practice of Pranayama [breath control] and Dhyana [Meditation]. The steadier you are in the seated postures, the more you can concentrate. Initially it is difficult to sit for long periods of time, steadily, in any of the meditative postures. But as with everything, practice is the key. Starting with short durations of 10 -20 minutes and slowly increasing the time to an hour or more is achievable with regular practice. Telling yourself repeatedly, “I am as firm as a rock. Nothing can shake me” will help to maintain a steady posture. In case of discomfort or pain in the legs after awhile, unlock the legs, ease them out and get back to the posture again. With continuous daily practice you will not experience any pain while meditating. In fact you will experience immense joy and a feeling of lightness. 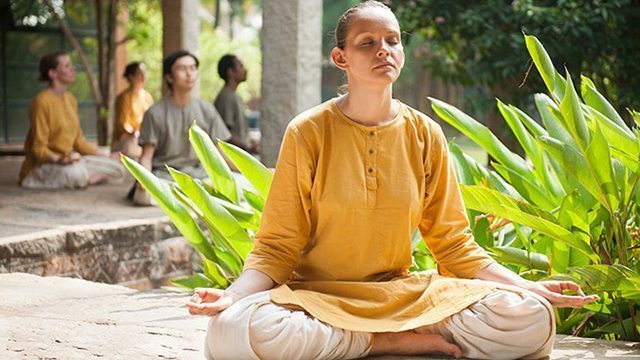 The experts vouch for the benefits of Padmasana and Siddhasana. If you sit in any of these asanas, even for 5 minutes daily, with closed eyes, focusing on your own breath, an image or even the Supreme Being you can experience extreme bliss and clarity of thought. These asanas increase digestive fire and give good health and happiness. They balance the nervous system. So, get down to sitting in the meditative postures instead of fancy furniture, whenever you can; for example- while watching T.V., reading, chatting etc. Let the benefits land in your body and prepare it for a good meditation practice.